Davao City, Philippines. 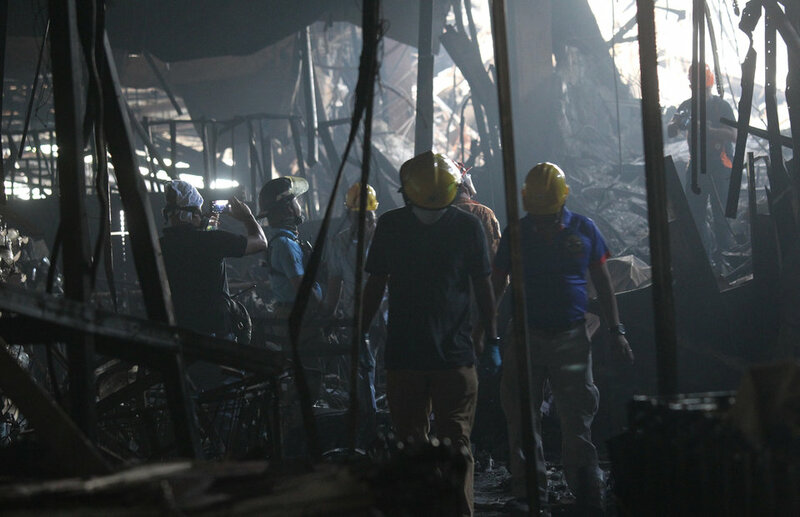 A government investigator into a blaze that led to the deaths of 37 staff at the southern Philippines offices of an American market research firm says there are indications of fire safety lapses that may have contributed to the tragedy. The Dec. 23 blaze in Davao City broke out at a furniture and fabric store on the third level of a mall, the New City Commercial Center (NCCC), and then engulfed the offices of the US firm, Research Now SSI, on the fourth floor of the same building in choking smoke. The only person among the 38 killed in the fire who did not work at the firm was a mall security officer. More than 100 SSI employees who were on duty that day managed to escape, of whom six were injured. Initial evidence from an ongoing investigation by Philippine government agencies indicates sprinkler systems on the third and fourth floors of the building were not working as their valves were closed, said senior superintendent Jerry Candido, who is director of logistics at the Philippines' Bureau of Fire Protection and one of the lead investigators into the fire. Candido said Research Now SSI employees may have been unaware of the fire beneath them for some time, because their office had its own alarm that was not connected to the system used by the mall. "That explains why people inside the SSI were not aware that fire is happening just below their floor," he told Reuters in an interview. His comments are the most extensive yet made publicly on the progress of the investigation. In a statement issued in the United States on Friday (29/12), Research Now SSI said it is working with the authorities involved in the probe into the fire and is "confident that an impartial investigation will reveal that it has complied with all the security and safety requirements required by law." "We are focused on helping our employees and the victims' families, and cooperating with the government agencies, over the coming weeks and months," said Gary Laben, the firm's chief executive. Privately held Research Now SSI is the result of a merger between Plano, Texas-based Research Now and Shelton, Connecticut-headquartered Survey Sampling International, which had operated the Davao call center, only three days before the fire. The merged company's major shareholders are the private equity firms Court Square Capital Partners and HGGC. Darry Gallego, assistant vice president of corporate services at NCCC, said the mall could not comment on an ongoing investigation, but stressed that safety requirements had been met, including having a sprinkler system. "The mall had passed through all the needed safety examinations and was certified by the authorities as being safe to operate and serve the public," Gallego said in an email. Candido cautioned that the investigation is still some way from being completed and it has yet to reach firm conclusions, particularly on the issue of liability. SSI, which rented the offices from NCCC, needed to have its own operating sprinkler system to get its annual fire safety inspection certificate, which was in turn required for its yearly business permit renewal, Candido said. Investigators will look into whether there were any questions that came up when NCCC and SSI were granted these certificates this year and in previous years, he said. NCCC last got the certificate in April 2017 and SSI in September 2017, according to Honee Fritz Alagano, Davao City fire marshal and spokeswoman for the Bureau of Fire Protection in the city. That was after passing the Davao City Bureau of Fire Protection's annual inspections, she said. Candido said it was the responsibility of both building owners and tenants to make sure that alarm and sprinkler systems were installed and operating. Under the nation’s fire code, if there were two alarm systems they should be integrated so that the mall's would have triggered SSI's, and vice-versa. Barbara Palmer, SSI's senior vice president for global marketing, said in an email response to a series of Reuters's questions about fire safety at its Davao offices that the firm could not address them specifically while the investigation is ongoing. Gallego from NCCC also declined to comment on specific safety issues. Candido said investigators are also looking at whether the ceiling material in the call centre was flammable but have not drawn any conclusions yet. He also said that the investigation was looking at some major structural questions concerning the SSI offices and how they related to the rest of the mall – issues that may not have put anyone in breach of regulations. For example, while SSI's fire exits would have passed inspection, only one of them had stairs leading directly outside the building. The others, he said, headed back into the mall. These areas quickly filled up with smoke making them useless as a means to escape, he said. Indeed, the position of the offices in the mall may have put them at high risk as the smoke from a fire elsewhere in the building would be funneled towards the offices, Candido said. "When fire occurred in any part of the mall, SSI will be fully engulfed. That explains why the exits were not used because they were cut off by the smoke," he said. Candido separately told reporters that initial findings indicated the fire was caused by an electrical problem in the ceiling at the furniture and fabric store, exacerbated by the failure of the sprinkler system on that same floor. He also said the Research Now SSI records showed that the firm’s latest fire drill was poorly attended. He did not say when the exercise took place. "Out of hundreds of personnel, less than 10 participated," he said, adding that three of those died in the blaze. NCCC's Gallego and SSI's Palmer declined to comment on Candido's assertions. Alagano, the fire marshal, said that soundproofing in SSI’s offices meant that staff may not have heard the alarm go off in the mall. She also said it is clear that some employees went to their lockers to get their mobile phones before trying to evacuate, wasting precious time. The probe will also be looking at how long it took the mall to call the fire brigade. Alagano said the fire likely started some time between 9.40 a.m. and 9.48 a.m., but the fire service database showed it did not get the call until 10.05 a.m and firefighters arrived five minutes after that. SSI says it has operations across the world and more than 3,500 market research, consulting, media, healthcare and corporate clients. It had about 500 employees at the Davao operation. It is part of the Philippines' $23 billion business process outsourcing industry. That is a vital source of jobs and foreign exchange, providing incomes key to driving what is one of Asia's fastest growing economies, though wages for call center workers are low at around $3,000-$5,000 a year, depending on location and experience. The sector employs about 1.15 million people providing services to mostly international firms, with the United States its biggest market. The industry expects that to grow to 1.8 million people by 2025 amid plans to expand beyond its mainstay call center services. Reuters reached out to numerous SSI employees in Davao in person and via their social media accounts but none of them agreed to be interviewed. Philippine President Rodrigo Duterte, who was Davao's mayor for 22 years and was credited with boosting its economy by luring business process outsourcing firms, has promised relatives of victims that the truth will come out.